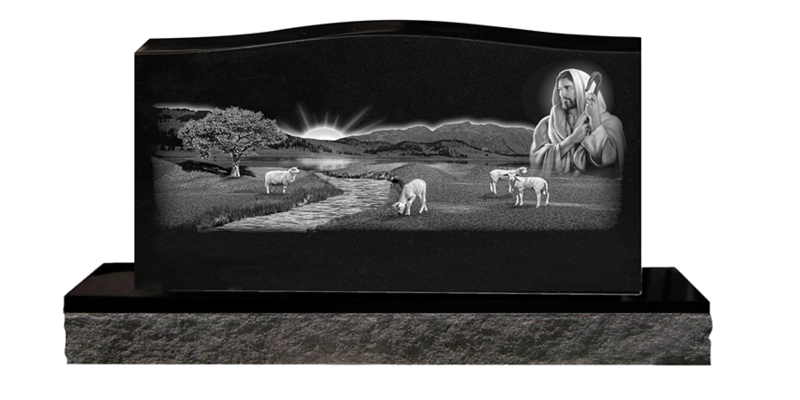 We offer a wide selection of custom markers and monuments for you to choose from. There are four basic styles to choose from Flush, Bevel, Slant and Traditional Upright Monument. With each style you will have four basic options that are involved with the purchase of any memorial; they are size, granite color, finish, and design. Typically you will select options in these areas based on your preferences. In some cases these decisions may be made automatically for you via cemetery restrictions. The three areas of cost to be aware of with any memorial; the cost of the memorial as you want it, the cemetery's cement foundation or setting fee, and sales tax. Each memorial is unique and priced according to size and color. Our pricing includes complete delivery to any Michigan cemetery. Feel free at any time to call for an estimate. We will do our best to answer your question to the best of our knowledge. We also specialize in cleaning and restoring weathered headstones, as well as final date cuts. We Are Proud To Be A Distributor For Patten Monument Company Located Right Here In Michigan! Above ground and easier to see than flush markers. Slight slope to top makes it easier to read and will stay clean longer than a flat marker. If 8” or taller they can be cored to receive cremated remains. You still need to be within 5 to 10 feet to read the marker making it hard to find. Larger design area allows for more information and bigger letters. Can be read from a greater distance. Stays much cleaner than flush or bevel markers. A Veteran's bronze service plaque can be attached to the back. By adding a base ( shown on left) you get extra height for visibility and lawnmower protection. While the family name, children's names, or other information can be placed on the back it may limit the ability of mounting the Veteran's bronze plaque. Easiest to find in the cemetery. Can easily be shaped in a wide variety of custom shapes, like a heart, tear drop, car, horse, etc..
Stays clean longer than other styles. Base of monument protects from mower damage. Can be cored to receive cremated remains. Can be read from a distance. Offers lots of room on back for design, lettering and mounting a Veteran's bronze plaque if family desires.